I am now writing on a light-weight, unlined journal. In an earlier blog post, I wrote about moving away from spiral, lined notebooks because I felt the need for change. It wasn’t until I opened the new unlined journal that I realized that there is an advantage to writing on the same type of notebooks. When I first opened the new journal to write an entry, my mind went as blank as the page that was staring back at me – it was as though my mind didn’t know what to do with the blank page. I am also a trying-to-be painter and I usually doodle and play around with paint on drawing books or drawing pads. Thus, when I opened the unlined journal, my mind couldn’t decide whether I would write or draw. Julia Cameron, in The Right to Write, tells us to begin where we are. I tried that and although it took a while before I was able to write anything, eventually I began writing…I wrote the date on the lower right corner of the second page. And on the next page, I wrote a couple of paragraphs explaining how I found the journal. Whew! That was more than a month ago, and my mind has by now gotten used to the idea that blank pages are also for writing on. Writing on a blank page has been liberating in a way, and has given me the opportunity to explore writing in different sizes on a single page, or varying the spaces between lines – to add variety to the journaling process and exercise the brain a bit. But the pervading feeling of something being amiss continued to plague me. I had been journaling far too long perhaps, writing on the pages about how I felt, and extracting whatever I could from my experiences. Journaling has centered mostly on my spiritual journey. Thinking back, I had been journaling the most during the dark and darkest nights of my soul. Those were the days when I grabbed my journal often and filled up a notebook within a few weeks. Through the decades, my spiritual journey has progressed. As it is with everything that is nurtured, the time comes when the darkness gives way to light, and light begins to pervade everything in varying degrees. This is what has happened to my spiritual life – I had finally reached a place where light is my companion and the dark days are now grayish, beige or brown…no more black days. I realized that journaling about my darkest years ( and I had plenty) had become a habit, and now that I am, so to speak enjoying the fruits of braving those dark nights of the soul, my mind has found it hard to find the impetus to journal. Journaling through the difficult times had been one of the most valuable tools in my spiritual journey. It felt liberating to be able to release the dense energies by writing down my feelings on the page. Admittedly, although I had tried many times to do morning pages, it has never worked for me. I love to journal with intent and purpose, to write my feelings as a way to heal. I didn’t know then that what I had been doing is called, transformative writing or reflective writing. 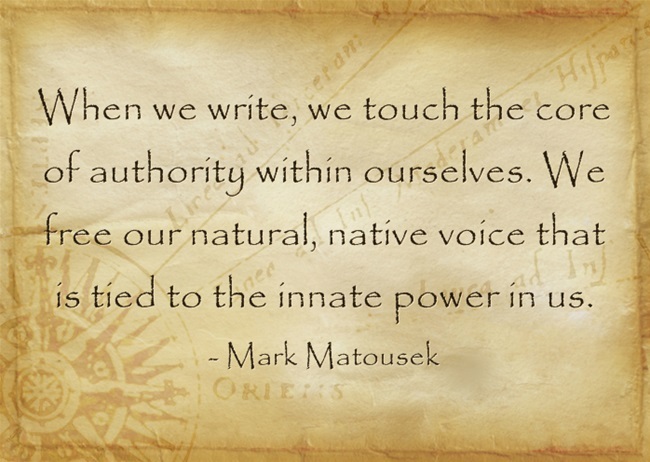 I learned this from listening to Mark Matousek during his teleseminar, Freeing Your Soul Through Writing. Have I freed my soul? To that question I can answer a resounding yes, and add that it is the kind of freedom that we all yearn for. Journaling was one of the tools that I used in my healing journey, hich spanned more than two decades. It is one tool I would recommend to everyone. Mark Matousek’s teleseminar helped me understand the process that I went through as I wrote my deepest feelings, fears and doubts on my journal. It also gave me insights on how best to proceed with my journaling. I began transcribing the audio recording in the hope of sharing it in this blog, but on second thought, I felt it was better if you listened to him yourself, if you were not able to join the live broadcast. If you want to download the teleseminar, click here. BTW: I’m a Julia Cameron fan from way back; used many of her books at different stages of my artistic development! I loved that you walk with the light more now, instead of the shadows. I also understand how easy it is to write when you are in the shadows. Now that I am also in the light more, I find myself writing less. Yet it seems you would want to do the exact opposite to feed what you want to grow. Anyhow, great post. I love that you wrote the date, and talked about getting the journal. A wonderful example of writing about *anything* to just get started when you are stuck. Cheers! I started my blog with the hopes that I would become inspired by the attention of writing, and write more then I was before. But what has happened is I am writing more in private, and feeling block with the online journal. I feel that when I write knowing no one is reading, my flow is easy and my thoughts come out organically. I also do not judge myself for spelling errors or typos which makes the process easier. Why have an online journal then? Why write my thoughts out for all to see? I question this, especially as we live in the time of the narcissist when people do things to be seen, but would not be as inspired to do what they are doing it if they did not have an audience. Do not get me wrong, I absolutely love technology, and am hooked up with the most popular social media hubs such as facebook, twitter, Instagram, Marco Polo, SnapChat and more. But I do question if I am doing things for attention, or because I want to do it anyway? I can tell you, I love to write. I do it anyway. It has been my lifeforce, my anchoring tool, my ultimate confidant, and the only way I know how to give life to what is in my head and give it meaning and purpose. My entire life I was worried about having people read my journals, so worried in fact, that I wrote a serious warning in one of my journals giving the reader permission to read one entry, but no more. If the reader decided to read more there would be hell to pay. I believe I was 8 when I wrote this warning in my super private journal. It makes me giggle at myself. How would I actually impose a punishment for someone reading my journals? How would I actually know if they did? I am curious what the punishment would be to an 8-year-old girl? What was hell in my mind? I will never know. What I realized over my life, is that no one actually read my journals to my knowledge. I found myself shocked and then disappointed by this initially. Then I found myself leaving my journals out in the open in the hopes that someone would be interested. I have no proof either way, but it appears I have been my own audience. This was an interesting observation because I realized what I was writing in my journals was not for myself as I was actually writing for other people. I was editing my experience, just in case, someone read my thoughts. Once I realized that I did not have an audience, my journals actually became real and I wrote down my authentic thoughts and experiences, and this is when I really felt the power of writing. Starting an online journal, or a place where I write my thoughts, I naturally have blocks. It makes me realize that the magic of writing could expand or never begin; and ponder what makes a good writer, versus a great one. It seems that writers that write for the extrinsic value and attention of an audience are rarely great, and the writers that write from the heart as if they were dancing alone in the mirror, can be life-changing. Perhaps this is all nonsense I am making up in my head. But it appears that if you could completely unblock yourself and just be authentically you, then the creativity would naturally flow from the heart. But this idea still alludes me still, but I feel it is possible. It has to be a combination of both doing it for the intrinsic purpose and the extrinsic purpose. I cannot see how you could separate them if you have an audience. My head is full of contradictory thoughts, and black and white observations of my self and others. I observe and slightly judge my own experience of choosing to create a blog, and be out in the open. But I admire those that are already doing it and I love that people are out there allowing other into their headspace, and bringing minds and hearts together. One of my goals in this life is to connect more with people. I have always had a strong desire to know what other people are thinking my entire life. I am constantly wondering, what is really going on in their mind? I really want to know. One of the ways I have discovered is through personal journalism written from the heart. When my mother and father passed away, I was hoping there were journals left behind or anything that would allow me access to their minds. I always wanted to understand my parents more, as they seemed like a mystery to me. But all I found were a few chicken scratches of thoughts and information that they left behind. I was devastated. I still am. I wish I could interview my mother and father and ask them who they were, and what they were thinking. I am genuinely curious why they choose the life they choose, and not another. Overall, I am fascinated by all the stories around me. Everyone has a story and its usually rather interesting to learn about others. I have yet to be bored by someone’s story. I think we are all rather interesting, creative and expansive. All of us are. When I tell people I love to journal and write the response I usually get is that is awesome, followed by a response of admitting that is not something they do, but would like to have the motivation to do. So it appears since I have the motivation to do this, and it comes naturally to me, I get to really dive into this blog experience and see where it goes. One more thing. Having an audience so far is a lot of fun and now I find it energizing. So here I am today, two years after starting this blog, and now I am finally ready to get over myself and just start blogging. What is the saying, the only thing that is blocking you from your progress is you? Yeah that fits me well.